^ Reviews, C. T. I. (2016-10-16). Conceptual Physics: Physics, Physics. Cram101 Textbook Reviews. ISBN 9781467210607. Bransden, BH; Joachain, CJ (2002). Physics of Atoms and Molecules (2nd ed.). Prentice Hall. ISBN 978-0-582-35692-4. Foot, CJ (2004). Atomic Physics. Oxford University Press. ISBN 978-0-19-850696-6. Herzberg, Gerhard (1979) . Atomic Spectra and Atomic Structure. New York: Dover. ISBN 978-0-486-60115-1. Condon, E.U. & Shortley, G.H. (1935). The Theory of Atomic Spectra. Cambridge University Press. ISBN 978-0-521-09209-8. Cowan, Robert D. (1981). 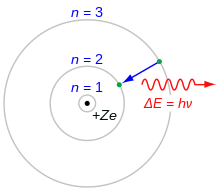 The Theory of Atomic Structure and Spectra. University of California Press. ISBN 978-0-520-03821-9. Lindgren, I. & Morrison, J. (1986). Atomic Many-Body Theory (Second ed.). Springer-Verlag. ISBN 978-0-387-16649-0.